This is a carte-de-visite showing General James Gillpatrick Blunt with eleven band members from the Eleventh Kansas Volunteer Cavalry and one from the Twelfth Volunteer Kansas Infantry. People are identified as (right to left): General James Gillpatrick Blunt, A. J. Shannon, William Bendix, M. X. Myers, Fred Marvin, Charles Warring, George Cohen, Henry Dutton, Wash Woolheter, Jack Halstead, Ed Walker, Captain George W. Quimby, John Myers, George Waite, Frank Mimers, M. E. Foote and George W. Mitchler. Blunt was commander of the District of South Kansas at the time this photograph was taken. 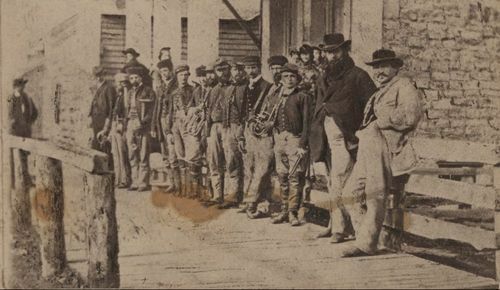 It was possibly taken after the Battle of Westport/Mine Creek.